(Nanowerk Spotlight) Researchers are putting great efforts into developing techniques to integrate graphene into nanoelectronic devices. Unfortunately, graphene has no band gap – a critical prerequisite for transistors – which essentially restricts its wider applications in nanoelectronics. Among the various techniques developed toward introducing a bandgap in graphene, hydrogenation or fluorination can efficiently solve this problem as they can open a considerable energy gap in the band structure of graphene. However, the experimentally realized fully hydrogenated and fluorinated graphene – namely graphane and fluorographene, respectively – both have a very large energy gap (>3 eV), which constrains their applications in electronics. Thus at present an urgent task is to find a feasible way which could reduce the energy gap of graphane or fluorographene into a desirable range. "Among various methods toward introducing a band gap to graphene, such as chemical functionalization, applying external electric field to graphene bi- and trilayers, and uniaxial strain, hydrogenation stands out since selective hydrogenation can well tune graphene's electronic and magnetic properties, as revealed by many theoretical and experimental studies," Zhongfang Chen, an Associate Professor in the Department of Chemistry at the University of Puerto Rico, tells Nanowerk. In new work reported in JACS ("Graphane/Fluorographene Bilayer: Considerable C-H···F-C Hydrogen Bonding and Effective Band Structure Engineering"), Chen and his team have now demonstrated theoretically, using density functional theory (DFT) computations, that graphane and fluorographene can be paired together through the C-H···F-C hydrogen bonds. "The unique C-H···F-C bonds define the conformation of graphane/fluorographene (G/FG) bilayer and contribute to its stability," says Chen. "Interestingly, G/FG bilayer has an energy gap (0.5 eV) much lower than those of individual graphane and fluorographene. 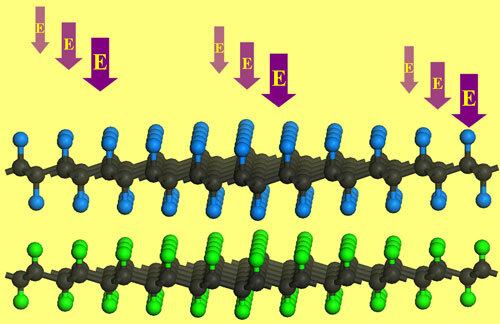 The binding strength of G/FG bilayer can be significantly enhanced by applying appropriate external electric field. Especially, changing the direction and strength of electric field can effectively modulate the energy gap of G/FG bilayer, and correspondingly causes a semiconductor-metal transition." He points out that their computations not only put forward the novel C-H···F-C chemical bonding into 2D periodic nanomaterial, but also identified a new effective approach to modulate the band structures. "We strongly believe that the experimental peers can realize G/FG bilayer with small energy gaps very soon, tune their band structures with ease by using external fields, and employ them in novel integrated functional nanodevices. We hope that our studies will inspire more experimental and theoretical studies on using weak interactions to tune electronic properties of graphene-related materials." "Especially" he says, "our work is another vivid example that we can solve some physical problems using our chemical insights."